I’m still feeling quite horrible from the massive asthma attack I had yesterday, all because I ran 15 minutes on a treadmill. I didn’t sleep at all during the night, maybe 10 minutes here and there. I ended up calling in sick to work at both my jobs. I just couldn’t breathe this morning. My lungs still hurt really bad, and there was just no way I could work a double shift and be active all day. I could barely even get up. If it’s asthma, then it’s all because of smoking, and that makes me very sad. I should’ve quit years ago, and now I’m facing the consequences of my actions. This is just way too painful and not worth whatever pleasure nicotine was giving me. I’m still not 100% sure if it’s bronchitis or asthma. Bronchitis is a virus, though, usually accompanied by cold-like symptoms, like a runny nose and headaches. I have neither of those two things. It is also characterized by large amounts of mucus being expelled by coughing. This is also something I do not have. I cough up stuff, but not in large quantities, or how I think it should be happening. I wish I was coughing up a lot of junk, because then my lungs would feel more clear, and I’d feel a lot better. Asthma is not a virus, and is not accompanied by cold-like symptoms, like bronchitis is. Coughing is mostly “dry” meaning no mucus is being expelled. This is what is happening with me, and therefore I believe I had an asthma attack. You don’t just get bronchitis from running on a treadmill. 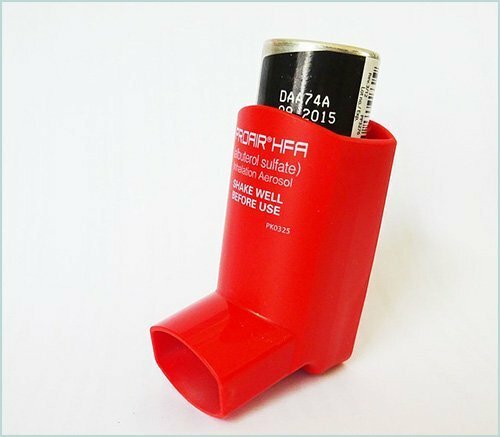 It makes me very angry that I cannot buy anything over-the-counter at the store to help my asthma symptoms. Who is in charge of these decisions? Probably not someone who is suffering from asthma. I understand the environmental implications of it all, but at least have a backup alternative ready to replace the one you are taking off the market. Please voice your opinion down below if this decision is affecting your life. What are we supposed to do? Just suffer and go through the endless torture of not being able to breathe? What kind of a life is that? What they apparently want us to do is go to the doctor, pay the co-pay, and get a prescription for an asthma inhaler. That is over DOUBLE what an OTC product would cost, maybe even TRIPLE, let alone the time and energy going to the doctor in the first place. The only thing available to consumers to buy are those asthma “tablets,” and even those are hard to find. I couldn’t find any last night when I was painfully walking around town trying to find an inhaler to comfort myself, only to end up in complete failure. As for what is happening in regards to withdrawal, well, there is none to report. I can’t even imagine craving a cigarette right now because my lungs feel so raw and swollen. One drag would send me into a coughing nightmare and my rib cage hurts so much already. I don’t want to cough anymore. Luckily, there are no cigarette cravings of any kind. Perhaps, if I wasn’t feeling so awful I would be craving one, but I’m not. I have the next two days off, and I WILL reach my milestone of 3 weeks of no smoking, I just hope I’m feeling better and that this asthma attack has subsided. If it doesn’t, I’m forced to go to the doctor, because I can’t live everyday like this. I don’t care about the money, I just want to feel good, and I feel absolutely horrible right now. On day 19 now. Day 18 and 17 were some of the toughest, almost as bad as 7 and 8. Fell asleep at work on day 17 and day 18 was hard to breathe. One piece of advice I will give – eat anything you want! I got through a bag of skittles due to the crave and stress. It really helped me and it is far better than a smoke. Good luck all. Bronkaid and Primatene tablets are OTC, they might add on to your anxiety though because they’re pretty much an upper. But they definitely help with asthma and working out. I used to use the Primetine Mist before they took it off the market. I hated them for doing that. I really needed it at the time.